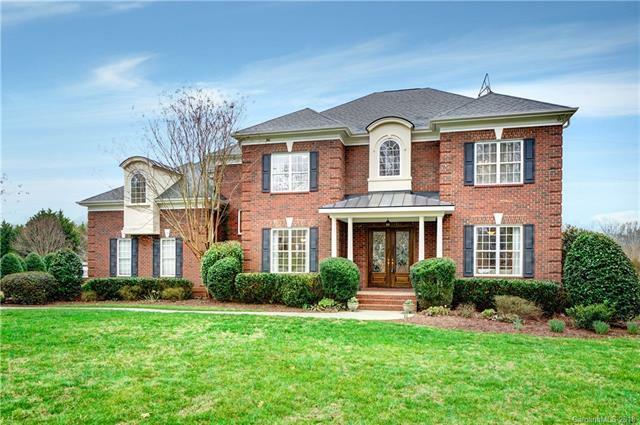 Fantastic opportunity to live in gated Chatelaine community in desirable Weddington school district at a bargain price point. The power lines in back acre afford you this great opportunity. Gorgeous custom built home with leaded glass double doors that welcome you into this stunning home. Formal areas, great room w/FP and beautiful built-in bookcases, well-equipped kitchen, breakfast area, office & guest suite/2nd Master on the main level. All BR w/full bath. 10-foot ceilings throughout. Hardwood floors on the entire main level. Dual staircase. Tankless hot water heater. Newly painted upstairs and down. Move In Ready!! Invisible dog fence in back acre + of the yard. Home sits across from one of the neighborhood's beautiful ponds with an additional 7 acres of HOA walking trails behind that border Twelve Mile creek. Owner/Seller is an NC Licensed Real Estate Broker. Priced to sell below tax value and below 12/14/2016 $650,000 appraisal!!! Offered by Austin Seagrave Realty. Copyright 2019 Carolina Multiple Listing Services. All rights reserved.